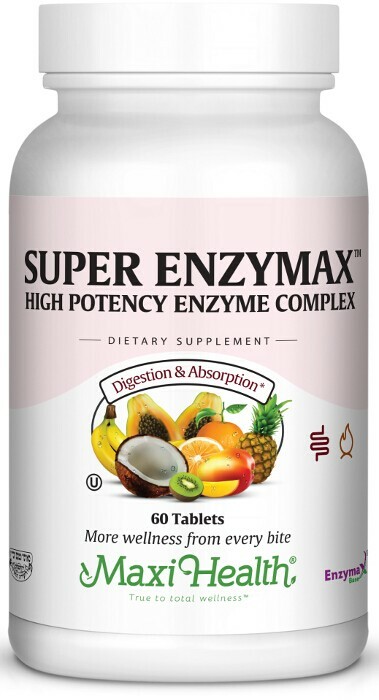 If you have been looking for a digestive enzyme formula, Super Enzymax™ from Maxi Health has what you are looking for. Enzymes are responsible for all metabolic functions and are vital for life. These proteins catalyze, or accelerate all normal biochemical reactions and are highly specific regarding what they do and under what conditions they do it. All food is composed of protein, fat, carbohydrate, and fiber. Enzymes break down each of these into progressively smaller components until they reach their basic building block form. The body uses these building blocks to rebuild and heal itself, supply energy, and remove toxins. Super Enzymax™ has the following enzymes in each capsule. Protease is a group of enzymes, which carry out the function of breaking down proteins in living organisms. It breaks down food proteins into smaller proteins and amino acids, maximizing digestion. Lipase is an enzyme that is used by the body to break down dietary fats into an absorbable form. Digesting fats and lipids are more difficult since they have to be carried by a water based transport system such as the blood and lymph. With too little lipase, the cell membranes permeability is not at optimum, and nutrients cannot enter the cell, while wastes cannot leave the cells. Amylase is needed to digest carbohydrates. Carbohydrates are one of the three major food groups needed for proper nutrition. Carbohydrates in food are an important and immediate source of energy for the body. Bromelain and papain are part of a group of enzymes known as proteolytic or protease enzymes (enzymes capable of digesting protein) Bromelain has been used successfully as a digestive enzyme. It contributes to the digestion of protein. Papain breaks down meat fibers, thereby rendering nutrients available to the digestive process. Papaya is the only known food containing papain. It acts impartially in acid, neutral, and alkaline mediums. Maxi-Health Research® is proud to provide you with this advanced enzyme formula. Super Enzymax® Complex is professionally formulated to provide the highest quality plant and microbial enzyme formula. Take one (1) tablet per meal, or as directed. (purified water, hydroxypropyl methylcellulose, vegetable glycerin). This product contains no animal products, soy, wheat, sugar, salt, yeast, gluten, milk, artificial flavors, colorings or preservatives.